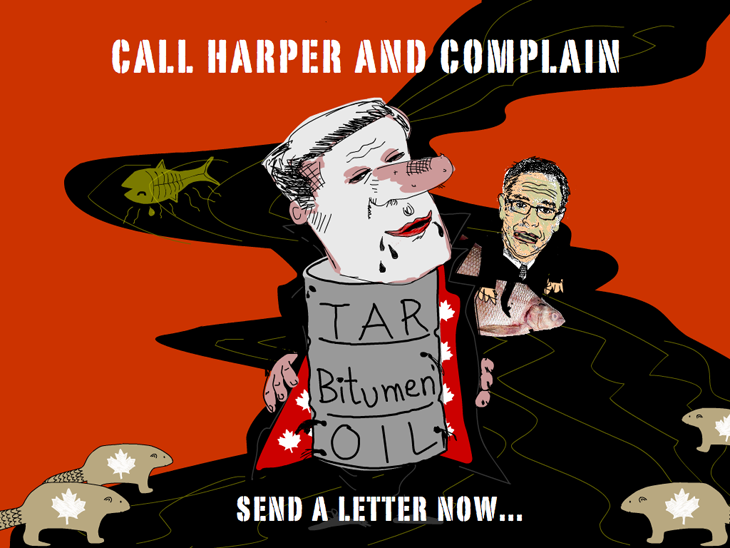 Want to read Franke’s illustrated letter to out Dear Prime Minister Harper, see it here: What is Harper Afraid Of? Well done! Harper is rendering our beautiful country with all its proud traditions of democracy, tolerance, peace-keeping, environmental preservation and social justice almost unrecognizable. How long are we going to allow this fascist libertarian to rip the heart out of our beloved land? Mr Prime Minister. I’m not a Canadian Citizen so you don’t owe me anything. I AM however an inhabitant of this planet and as such I feel you need to listen to me. Don’t act like the man in a sinking boat who is so glad that the leak is in some other part of the boat. Once the air, water and land are despoiled, that’s it for mankind. Picture a disaster on the magnitude of the Deepwater Horizon Spill in the Gulf of Mexico of 2010 happening IN your country ON your watch. How would you explain THAT away. Tar Sands Oil is NOT worth the risk involved in it’s harvesting or transportation. Period. Please don’t be led around by the nose by big money (big oil) Grow a pair and do the right thing please. Thank you for your kind attention. This is not ‘your’ (Harper) government; it is the Federal government, currently managed by the Conservatives. You are supposed to be a leader, representing your constituents and party (as a collective voice) not a unilateral decision maker governed by your own ideological and theological biases with obvious limitations when it comes to the rich diversity of our population. Canadians are well known for their complacency towards politics and tolerance when it comes to others. You have succeeded, however, in causing us to be alarmed at your self-serving economic and corporate directive bent on undermining all the social and egalitarian advantages achieved over the past 60 years. I find it hard to believe that you are so incredibly short-sighted as to undermine all the scientific evidence from leading world organizations on matters of the environment and dangers confronting both Canada’s and world populations as a nation state. I can only hope that your fellow Conservatives will hold their responsibilities to the people with greater reflection and insight.